The Okanagan Jewish community has had an active last few months. Services were held Dec. 9 and 10, led by Rabbi Shaul Osadchey, as well as Jan. 20 and 21, led by Cantor Russell Jayne. Each of the morning services was followed by a potluck luncheon, giving community members an opportunity to socialize. The OJC has been fortunate to have services throughout the year conducted by Osadchey and Jayne from Calgary and, in their absence, OJC members Evan Orloff and Steven Finkleman. This has brought members together and helped strengthen their faith and deepen community connections. 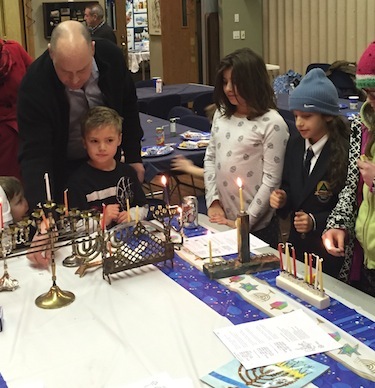 A Chanukah celebration was held on Dec. 12, well before the holiday, because many families planned to be away during winter break. At the party, there were songs, dreidels and the lighting of menorot. Sufganiyot were served and there was Chanukah gelt for the children. On Dec. 17, a Chanukah and holiday baking class was led by OJC member Barb Finkleman, and sufganiyot and latkes were made. These classes have become a regular event and another was held Feb. 4, with OJC member Philippe Richer LaFleche assisting Finkleman. In the February session, they made chocolate babka and vegetarian Indian food. In other community news, mazal tov to the Finkleman family on the birth of Jeremy and Mahla’s new baby boy – Lev is a baby brother for “big sister” Shiri. The naming and bris took place in Vancouver. Also, the community thanks Len and Faigel Shapiro for funding new tallitot and for a new custom-made tallit holder in memory of Sam Larry. The holder is now on wheels and can be easily moved to the entrance for services. Thank you to Marv Segal, Riaz Mamdani and Steve Itzcovitch for, once again, sponsoring the brunch for this year’s OJC Golf Classic. Plans for this year’s tournament are well underway. Since it will be the event’s 20th anniversary, the OJC is trying to make it the biggest and best ever. As always, the entire B.C. Jewish community is invited to participate on July 23, which will be a fun-filled day of golf and socializing. To register, visit ojcc.ca. For more information or sponsorship opportunities, contact Mark Golbey (250-868-1782 or [email protected]) or David Spevakow (250-317-5283 or [email protected]). Finally, this year’s OJC Passover seder will be held on April 10 at the Harvest Golf Club. For more information or to RSVP, contact Spevakow.